It may be hidden or carefully stored, but it is there…. That skein – and that other skein – of yarn purchased “awhile back” for those scarves. 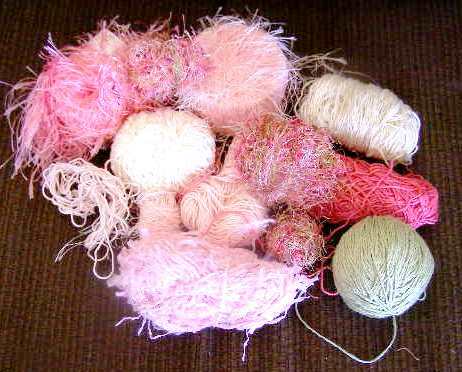 It was called “novelty yarn” with exotic names such as “eyelash” or “metallic fun fur” or “fuzzy feathers”. It sang its siren song to every knitter at some point in time and now languishes in our yarn stash! A small portion of The Stash that was used to create the sweater. After many starts/stops/failed attempts to knit an adult garment or accessory with mine, I decided it was not an adult yarn. I paired the multi-colored pink/green/golden”fuzzy yarn” in the center of The Stash photo with some other leftovers and decided it would be a child’s sweater. My mother once knit me a sweater with popcorn stitches on it. I loved it! So I knew popcorn stitches would be featured. When knitting with limited (and unknown) lengths of yarn, I have to recommend top-down knitting. It simplifies things, because when the yarn runs out, time for a new color! So, Cast on 71 stitches with leftover ballerina pink microfiber yarn from at least a decade ago. A few rows of garter stitch with the fuzzy yarn and then some green silk yarn leftover from the Silk Sage Cardigan. 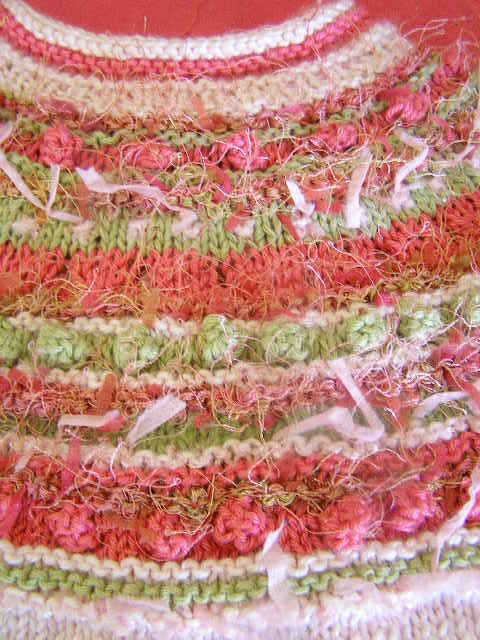 Popcorn stitches in leftover Paton’s Grace in a bright pink…. Popcorn stitches are a bit tricky. They tend to create holes – which detract from the bubble effect. I played with them for a bit and determined that if in the return row (row after popcorns are stitched), which was a purl row in this design, a stitch from the row below is picked up and purled with the popcorn stitch – the hole is closed! Popcorn stitches are also perfect for placing increases – required for top down round yoke cardigans. Just Make 1 Purlwise into the back of the popcorn on the return row! Another increase row was simply knit 4 Yarn Over (K4, YO) across the entire row, which created eyelets! 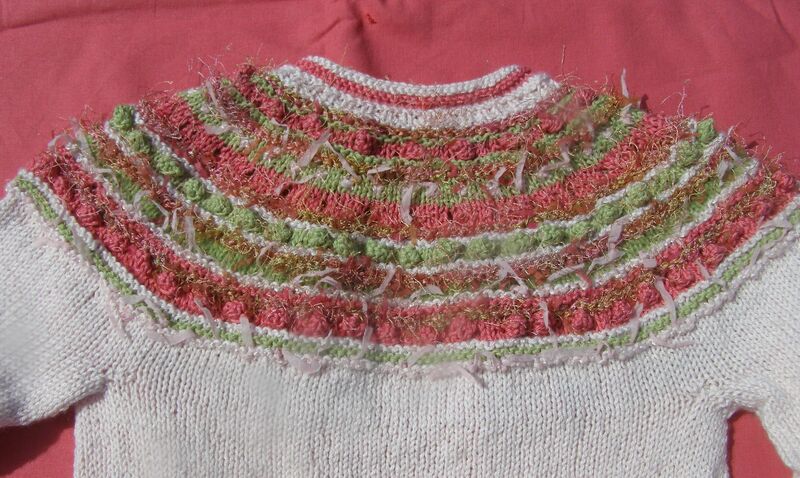 The light pink “eyelashes” were knit either as garter stitch (one row only – yarn was a bit thicker than others used) as occurred in the last row of yoke garter stitch or as garter stitch windows in a green stockinette ground. 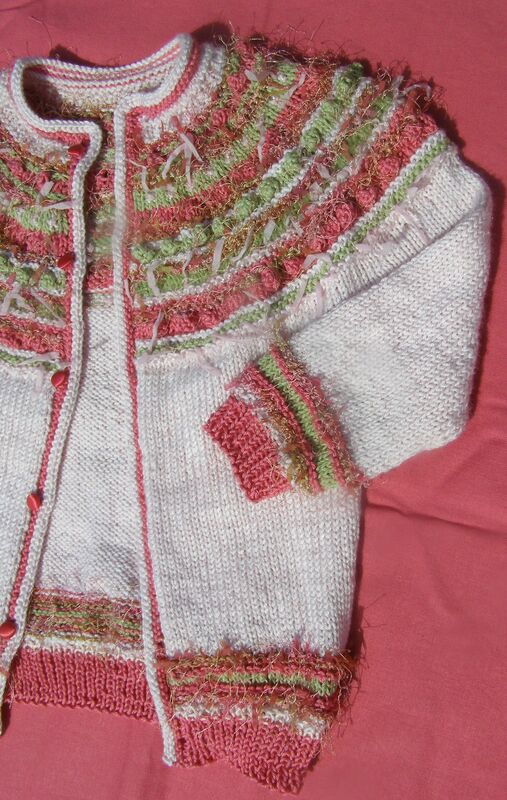 After the yoke, stockinette stitch and the pink microfiber yarn created the body. Weaving in the ends was not a joy, but that is what TV shows are for! Two rows of garter stitch up the fronts and around the neckline finished the edges nicely. Such a fun pattern! Such a great use of a previously languishing fun yarn! Just in case anyone else admits to their stash of languishing novelty yarn – I will be posting the pattern in a few days! 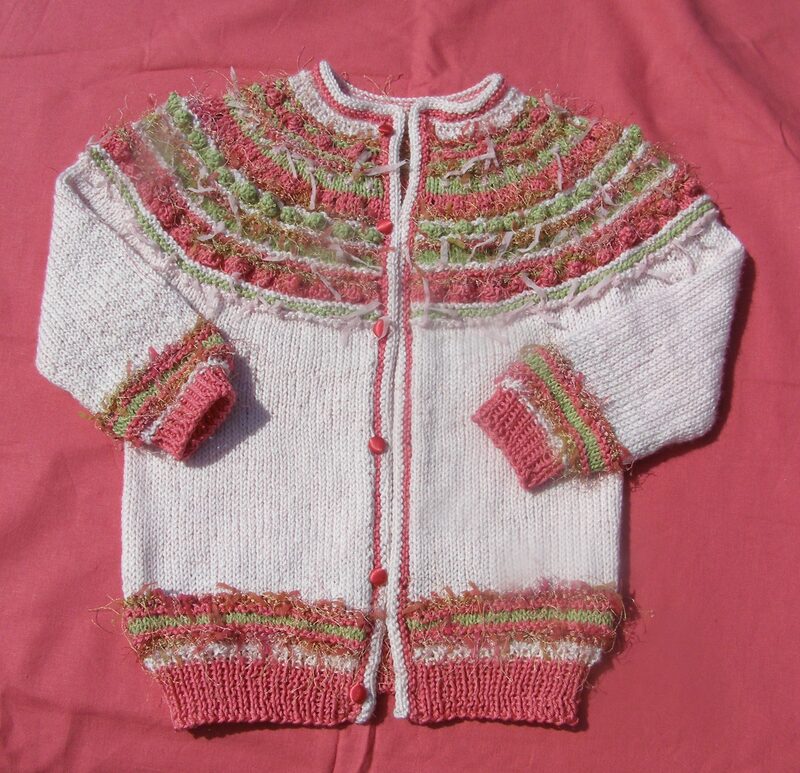 This entry was posted in Knitting, Stash Couture and tagged knit topdown, popcorn stitch, top-down child cardigan. Bookmark the permalink. What a great way of using up all those odd ‘bits’ left from other projects AND make a little person very happy! Well done. I Love It!!! What a great idea. And I am going through my stash and have lots of those bits and pieces to come up with one, although it may be more boy colors than girl!